Image caption Courtenay Griffiths has no doubt over the morality of defending alleged war criminals. 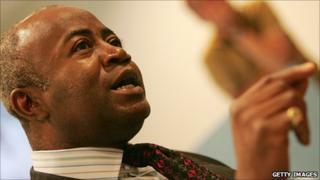 Courtenay Griffiths has acted for the defence in some of the UK's most controversial cases. He has defended the IRA following bombing attacks in the UK, as well as representing one of the youths cleared of murder charges relating to the death of Damilola Taylor - the 10-year-old boy who was killed on a London housing estate in 2000. Most recently, his position as lead defence lawyer for former Liberia President Charles Taylor has seen his cross-examination of supermodel Naomi Campbell and other high-profile witnesses make headlines across the world. Talking over the phone from The Hague, he discussed his career with the BBC World Service's Matthew Bannister. He explained that although defending people like Mr Taylor is considered controversial, his conscience remains clear. "Our system of justice cannot operate unless there is a semblance of equality between prosecution and defence. Otherwise it becomes an inquisition and that would soon lose the confidence of the public. "It is right and proper that a defendant, however heinous the crime committed, has the right to the best representation." One of the first times I went to court in south London, I arrived in court suited and booted, brief in my briefcase - only to be told 'Oh, the defendants sit at the back of the court sir'. Despite the serious allegations of war crimes levelled against Mr Taylor, Mr Griffiths maintains it is irrelevant to his right to a good defence. "The morality of Charles Taylor is none of my business. "That's between him and his God, whichever God he chooses to worship. My job is to present his case in court. I'm certainly not going to be making moral judgements about any of my clients. I've defended, for example, terrorists - but to make a moral judgement about such defendants is to forget that, you know, one man's terrorist is another man's war hero. It is this strong belief in fair representation for the accused that drives Mr Griffiths, and that his own view on whether his client is innocent or guilty has never had any bearing on how he works. "My job is to present a case, and it's for the jury or for the judge to decide that issue. Consequently it's not a question that I ask. I may have my own suspicions, but at the end of the day I'm not the person returning the verdict, so consequently my views are totally immaterial." Mr Griffiths' determined attitude to his work is a product of a challenging and diverse upbringing. In 1955, his father moved from Kingston, Jamaica, to Coventry in pursuit of work as a carpenter. Several years later, in 1961, the rest of the family followed. It was no small relocation - Mr Griffiths was the second youngest of eight brothers and one sister. "The first time I saw my father was when we got off the boat train from Dover at Charing Cross, a station in London," he remembers. Almost immediately he was being subjected to, in his words, "bizarre racism". The sight of 11 black people walking through the centre of post-war Coventry was enough to stop most people in their tracks. "All the white citizens in Coventry would stop my parents and ask: 'Can we touch them? It's good luck.' That was kind of disconcerting. "It was a completely novel event for them. Constantly we'd virtually stop traffic in Coventry anytime we ventured out." But the arguably naive racism of passers-by soon made way for more serious attacks which had a lasting impression on a young Courtenay. "I personally remember one afternoon being in the Precinct - that ugly concrete structure in the middle of Coventry - and must have been about 14 or 15 at the time. "Something happened, and I was taken by a police officer, a very large chap I remember, to the police box in the centre of town. "Me with my public education was trying to argue the toss with him. He was having none of it. He grabbed me round the collar, pushed me up the face: 'Listen blackie, you're in police custody now, don't mess around'. "Whenever there was an incident in Coventry involving black youths, the first port of call would be our house because there was eight boys living in that house." Spurred on by these events, he saw law as a way out of the life he and his family were living, a life supported by the sole bread winner in their house, his father. "He was always talking about the famous barristers in Jamaica, in particular Norman Manley who was a British QC before he later became prime minister of Jamaica. "He always extolled those virtues to us. I think a major influence was also the church in that some of the best advocacy or oratory I've ever seen in my life was done by uneducated black men who could rouse a congregation of hundreds of people into hysteria, just by their mere presence and delivery." As one of the few black men in the British judicial system, his early endeavours in the courts were challenging. "One of the first times I went to court in south London, I arrived in court suited and booted, brief in my briefcase - only to be told: 'Oh, the defendants sit at the back of the court sir'. "Meaning, because I was black, I had to be awaiting a charge, or had to be up on a charge. I couldn't conceivably be a barrister representing anyone in that court." He found the best way to deal with such prejudices was to tackle them head on, more often than not with humour. "Often, I'd open my address to the jury by saying: 'With my white wig and black gown I look like a pint of Guinness, don't I? Good head though...'. "They would look at me initially, there would be a sense of apprehension, then I would burst into laughter and then they'd feel confident enough to laugh as well." Mr Griffiths' early cases would be conducted in front of an audience of few. Now, however, the televised courtroom has seen him thrust into the public eye. It's a distraction that he says does not cross his mind. "When you're cross-examining, you need to focus on the witness. You need to see the witnesses' reactions to your questions, not merely in terms of the answer, but in terms of their facial expressions, body language and so on. "Then you need to listen to the answer you're given, to see what opportunities arise out of that answer. "You're also controlling all the notes you've made and you've got the paper on the lectern in front of you - you tend to be focusing on that. "What's happening in the public gallery with the television cameras and the rest of the media doesn't really enter into my mind." However, he does admit that the medium of television does suit what he describes as a "performing art". "And like every other performing art, you have to prepare well and you have to practise that skill. "What you see in court today which everybody is lauding, my cross-examination of Carol White and Naomi Campbell, people seem to forget that it took me 30 years to develop those skills. On top of that, people don't see me working in my study until two, three in the morning." You can hear the full interview with Courtenay Griffiths by Outlook on the BBC World Service by clicking here.